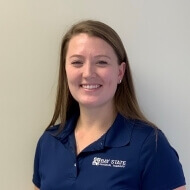 Keri attended Stonehill College in Easton, MA and graduated in May 2015 with an interdisciplinary bachelor’s degree for Allied Health Sciences focusing on PT. She then continued her education at MCPHS University in Worcester, MA for her physical therapy program and graduated with her DPT in May 2018. During her graduate studies for physical therapy, Keri worked as a rehab aide in the Salem, MA office for 3 years over the summers and on school breaks. This allowed her to gain excellent clinical experience and direct patient interaction to facilitate her hands on learning and clinical practice. Keri grew up playing softball, figure skating and rugby, all of which have sparked her interest for physical exercise and rehabilitation. Keri likes to use manual interventions that prioritize hands on treatment, including massage, joint mobilizations and advanced stretching techniques. Additionally, Keri’s goal is to educate her patients on their impairments and what they can do to get better. Through these interventions, Keri promotes independence for her patients with functional and sporting activities. Keri enjoys working with all age populations across the developmental lifespan and tailors her treatment plans to the specific goals and clinical presentations of each of her patients. Outside of her physical therapy career, Keri enjoys exercising, being outdoors and spending time with her friends and family. Keri treats patients at the Swampscott clinic Monday-Friday.